here I show you my new playful and tasty party favors!!!! 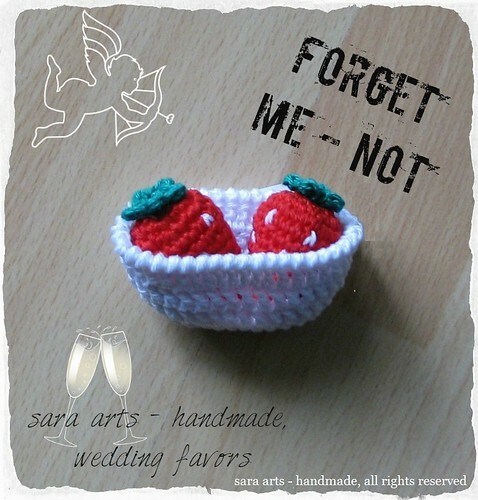 Lovely crochet baskets dressed with cherries and strawberries. Thanks to take your time and send me a comment. I will replay to you soon, come back and read my message. 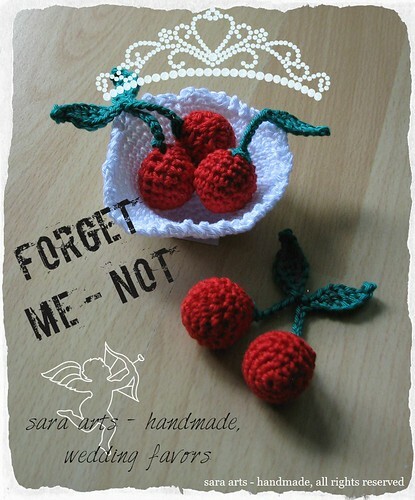 If you like you may follow Sara Arts also via Facebook and Google+, join me and be connect. Help each other to spread out our love for Creativity and Arts!!! 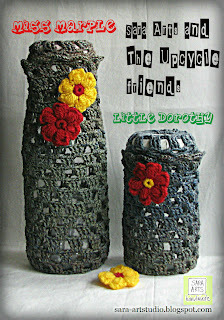 If you are a blogger too, I look forward to have a tour in your "little world". I love to hear from you!!!! Click here and see the images of the five Art Works of the Week, then vote your favourite!!!! Which is your favourite Art Work of the week? 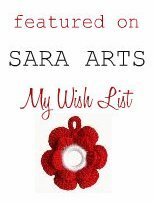 Are your Art Work or Handmade Creation listed in My Wish List of the Week? Copy the HTML code and show the button to your readers. All artworks and images on this blog are protected by copyright. Photos and contents from this blog cannot not be used without my prior consent. If you are interested in my creations for commercial purposes, please, contact me before hand. I am glad you like my work, but please do not copy my design to sell yourself. Nice people don’t pass off someone else’s hard work as their own. If you wish to use any of the photos or text on this website, please ask first. [Tutti i lavori e le immagini di questo sito sono protette da copyrights. Foto e contenuti di questo sito non possono essere usati senza il consenso dell'autore. Se siete interessati alle mie creazioni per scopi commerciali, contattatemi prima di tutto. Sono lusingata che appreziate il mio lavoro, ma non copiate i miei disegni per poi rivenderli. Le persone oneste non sfruttano il duro lavoro degli altri per il proprio profitto. Se desiderate foto e contenuti di questo sito, contattatemi prima.